About one third the way up the west coast of Vancouver Island, Barkley Sound forms a large bay, perhaps 15 miles across and 10 miles deep. Clustered in this bay is a group of islands called the Broken Group which vary in size from exposed rocks to islands several miles long. Many of these are very close together, while others require a passage of a mile or two to be reached. 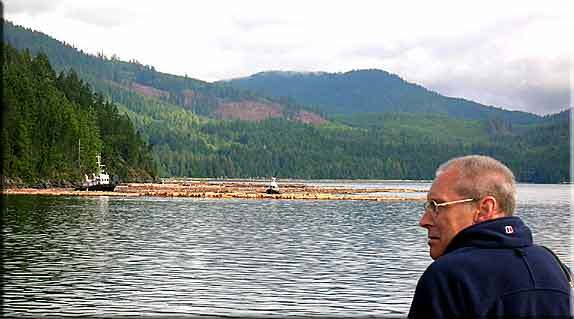 Most are wooded, and except for those exposed to the Pacific Ocean, most sit in relatively calm water with little tidal current. 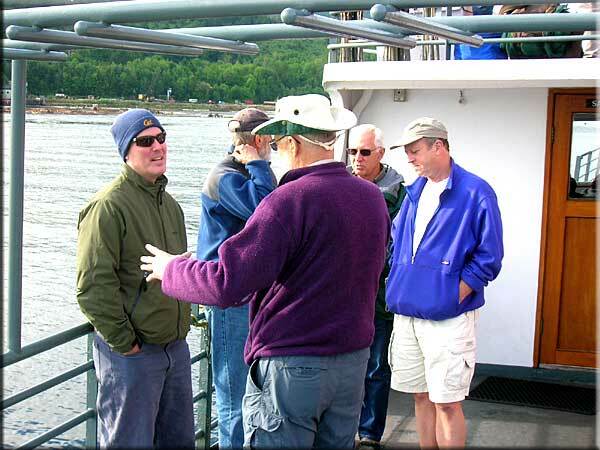 On June 24, 2007, six of us made the ferry crossing from just south of Vancouver to Nanaimo, on Vancouver Island, and then made the hour drive to Port Alberni. This small town, which is supported by logging and fishing, sits at the head of the Alberni Inlet, a 44 mile long fjord which runs from Barkley Sound two thirds across the width of Vancouver Island. 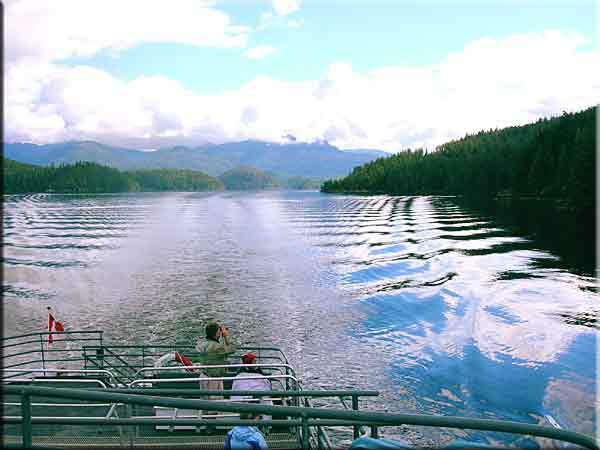 After a night in a motel, we loaded our kayaks and supplies aboard the old island ferry, Frances Barkley, and headed down the Alberni Inlet to Barkley Sound. This deep, narrow inlet, sits between wooded mountains on both sides. 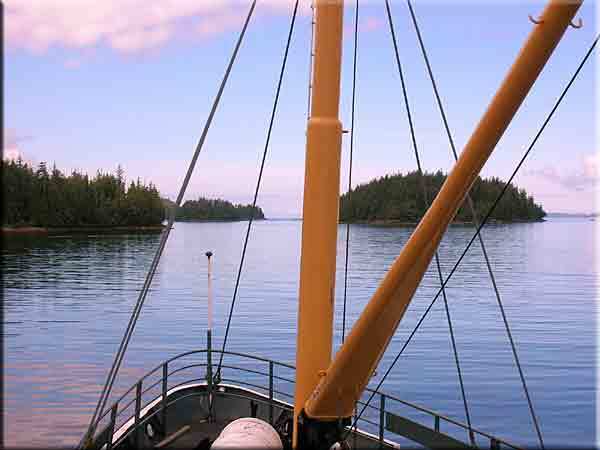 As the boat moves down this channel, one watches the fishing boats and logging tugs working at their trades. Eagles are frequently seen and occasionally black bear. The four hour ride to Barkley Sound gave us time to get acquainted and for those of us new to kayaking this area to get tips from the three who had been here before. Organization was everything, as supplies had to fit into the fore and aft storage compartments of the kayak. The islands have no fresh water, so part of our planning had to include carrying water for the five days we would be camping. This was best carried in heavy plastic bags which conformed to the bottom of the kayaks. Sam Webster, Bob Bryan, John McKean, Ron Oberst, Dan Yost. Weight is less critical to kayaking than it is in backpacking, as once the kayak gets up to speed, it glides quite nicely despite having full compartments. Space is a bit more ample than backpacking, perhaps twice as voluminous as a hikers backpack, depending on the design of the kayak. While one does need to plan carefully, there is a bit more room for luxury than in a hiking situation. Alberni Inlet, 44 miles long. The weather was cloudy when we left Port Alberni, but the clouds thinned and patches of blue sky appeared as we approached Barkley Sound. 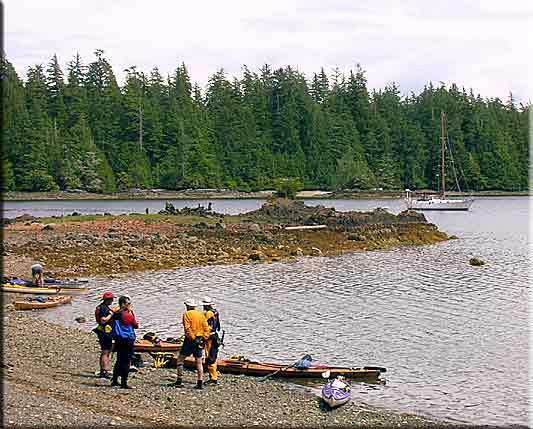 Our destination was Sechart, a tourist lodge located at the back of the sound, as well as the staging area for many of those wishing to kayak the islands. 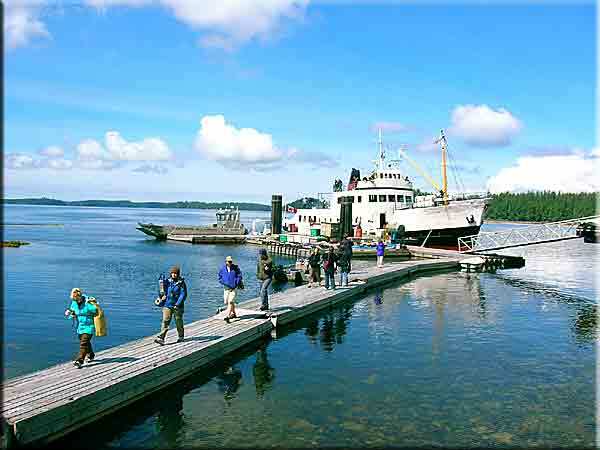 Sechart is only reachable by boat, but it does have fresh water, kayak rental, and importantly, hot showers for those emerging from their time of camping on the islands. Tugs working a a group of log rafts. Before loading kayaks at Sechart, we had a presentation by a Canadian Park Ranger. The Broken Islands are part of the park system, and the ranger was informative and helpful as he described safety precautions for kayaking, wild animals we might encounter, and protocols for low impact camping. 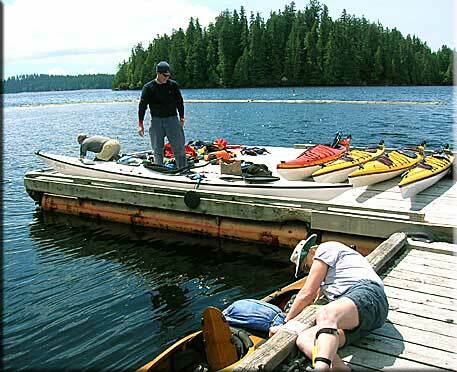 Next came the task of loading the kayaks with camping gear, food and water. A properly packed kayak is more stable than a light one. The key is to keep heavy, dense items at the bottom and as close to the center of the boat as possible. For example, I packed my water in the fore and aft compartments as close to the cockpit bulkheads as possible. My heavy canned items I put in a bag in the cockpit, right behind my seat. It is critical to have tried the packing at home before starting the trip. Compartment hatches are small, and it is very easy to pack bags which will not fit through the hatch. On the dock, away from home, is the wrong time to solve a three dimensional puzzle. There are about 6 small campgrounds scattered among the islands. We decided to paddle westward through the islands to one of the farthest of these sites to get as far from the madding crowds as possible. Our choice was the site on Turret Island. This wide, irregularly shaped island was beautiful, and gave us a good starting point for day trips to the westerly islands and the bigger ocean swells, should we desire that challenge. We started with a fairly open passage of about 2 1/2 miles into a breeze of 10 knots. The small chop was not bothersome, and the wind made for comfortable paddling. We soon reached the camp ground on Dodd Island, and stopped for water and a snack. Loading the kayaks with supplies for five days. Rest stop on Dodd Island. 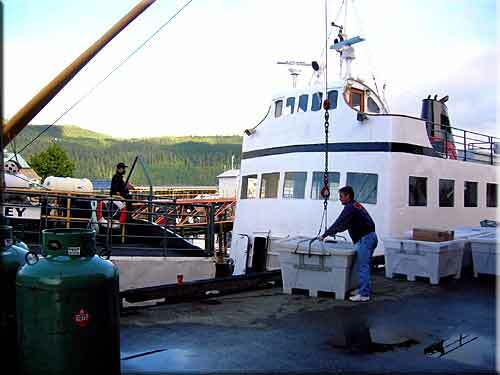 MV Lady Rose Marine Services: They operate the ferries down the Alberni Inlet.